Happy birthday to George Clifford and Salif Diao – the Pompey players from the Blues’ past born on this day. Clifford was well before the time of anyone and isn’t known to me. Diao is better known from his time with others – before and after Pompey – but I recall him pretty well from his Blues days. I draw a blank today – not at MK Dons today either – but do recall a good few of the games previously played. 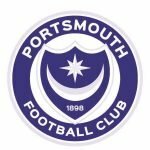 What are your memories of Clifford – obviously well too early for anyone and clearly no one would have seen him play – and/or Diao – from their Pompey days? Also have you taken in any of the games previously played today – if so what are the memories from them too?